Inspiration Wall extension creates a unique possibility for your clients to share their product-ideas, discuss them with other members and let you create a public social mood board. Customer can add product ideas to favorites, like them via facebook and much more! Visitors can view inspirations of all site users or only personal inspirations. Customer can add design inspirations by uploading pictures. 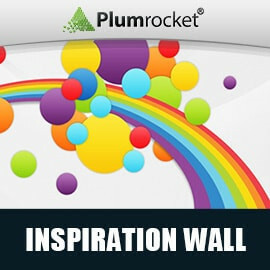 Plumrocket Inspiration Wall Magento Extension is a proven tool for making your store more social media integrated. Research has it that more than 50% of all new membership sites members daily come from social shares via Twitter, Facebook, Tumblr, Google Plus, and email. This Magento social plugin will let them fully enjoy the opportunities an Inspiration Wall can give. With Magento Social Media extension from Plumrocket.com your customers will find it really easy to add their favorite design inspirations. A membership site owner will also benefit from the advantages that come with any social media platform being added to the store marketing strategy – increased traffic and sales with increasing numbers of new clients driven by inspiration. Plumrocket Inspiration Wall Magento Extension works well with Plumrocket Faves and Live Feed Extensions making key information about the faved products automatically brought over to the inspiration wall including the description, tags, sharing options, and counts of how many times it has been viewed, faved, and commented on. Admin has full control over the Inspiration Wall. He can edit inspirations, mark them as inappropriate, set the default status of new inspirations, edit tags, etc..
Inspiration Wall is absolutely great and very useful to my customers. My store looks more engaging now. A great first experience with Plumrocket. I would recommend it to any store owner! I purchased this extension and requested customization. Installed on a custom theme and worked perfectly fine. Support was generous and supportive during the installation to do some adjustment to fit the theme. Highly recommend the extension, and PlumRocket for any problem. Hi, I'm Sidney and I'm an artist. Currently working on my web store and this add-on helped me a lot to unite my customers to discuss my products together with uploading their own ideas for discussion. It's is amazing, thumbs up for developers! Hi, I've been tweaking with this extension a lot and I also asked for some customization: it's a must-have for any social-willing website. In my case the inspiration wall attracts customers in order to interact with other people and share their passion.